We have a blank canvas to show you and I couldn’t be more excited. Thank you for following along with this adventure and the renovation process. 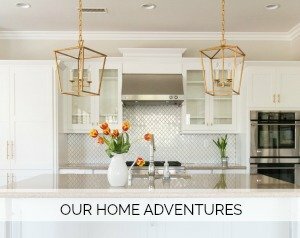 Seeing the before photos, you know that we had beautiful bones to work with and just wanted to infuse a fresh, clean look in an effort to make this home our own. I will keep this short and sweet and let the photos do the talking. Here is our new home downstairs reveal. Staining the railing a darker color creates a nice contrast with the now lighter walls. 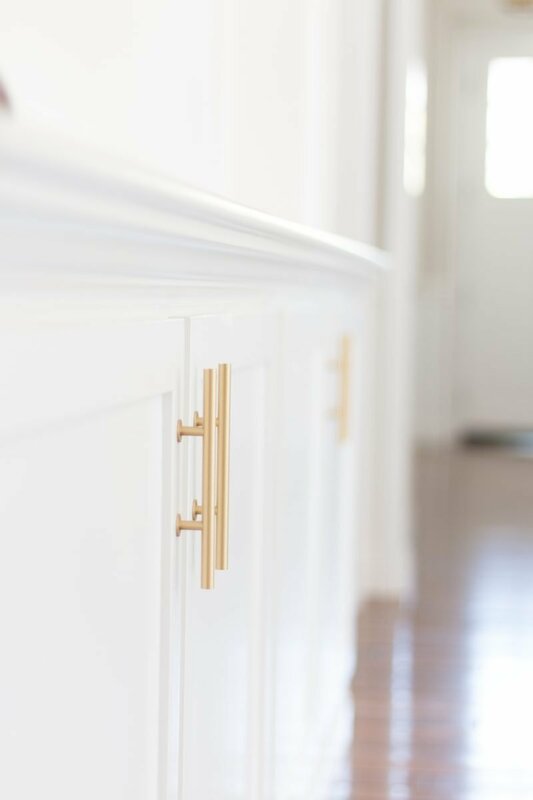 I have known for a very long time that if I ever had the chance to design my own kitchen I would use the gold hardware. I have had a crush on it for quite some time. It also mimics the handles on the stainless appliances so it works well in this space. what sources did we use? You can see we still need to have some shelves cut for the cabinets and get our things moved in! I chose this backsplash for a couple of reasons. First and foremost, with the very angular look of the shaker style cabinets, I thought the kitchen could use a softer more feminine curve. Furthermore, there is very little backsplash so I felt it was a great spot to be a little more creative and if I tire of it down the road it won’t be a huge investment to swap it out. 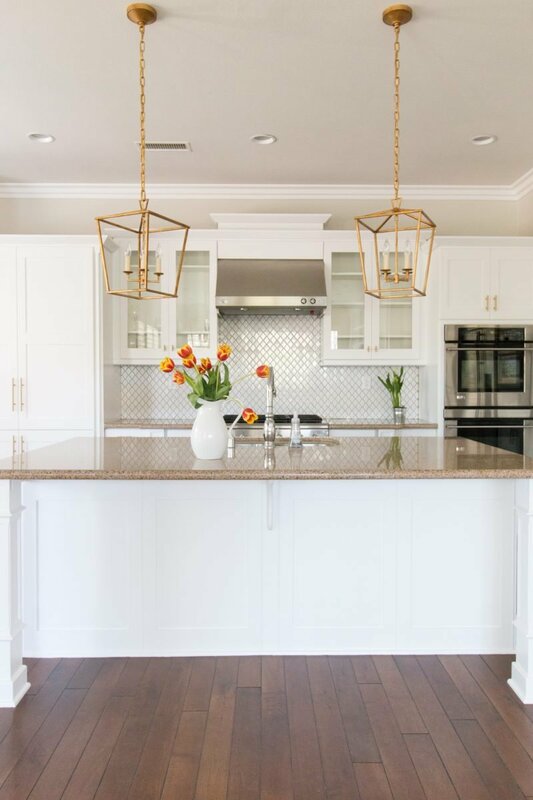 While I love a classic subway tile backsplash (and used it in my previous home) I thought this would add a bit more personality without committing to something too busy or that would compete with the existing granite countertops. Here is a shot looking back into the great room. I am really pleased with how the white lacquer came out and am so exited to start decorating those shelves! 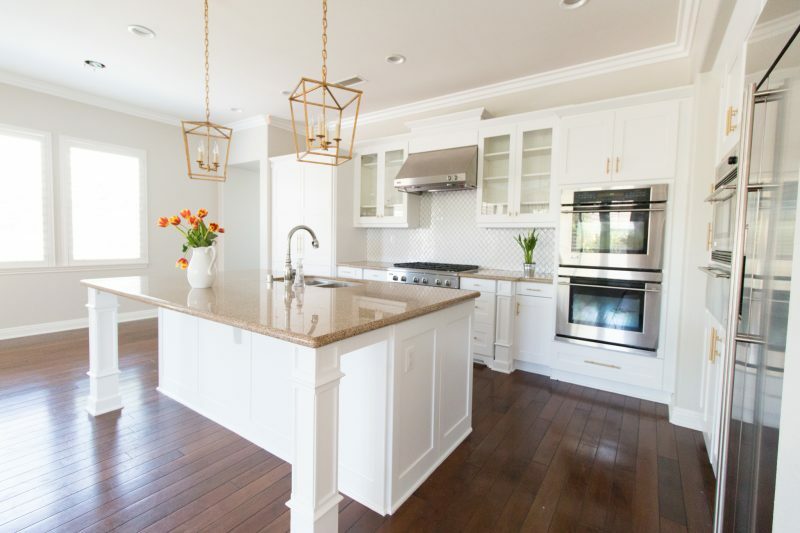 What is the lacquer color on the cabinets? Not entirely sure but I am getting that info for you. Would I recommend my painters? Yes. If you are local shoot me an email. 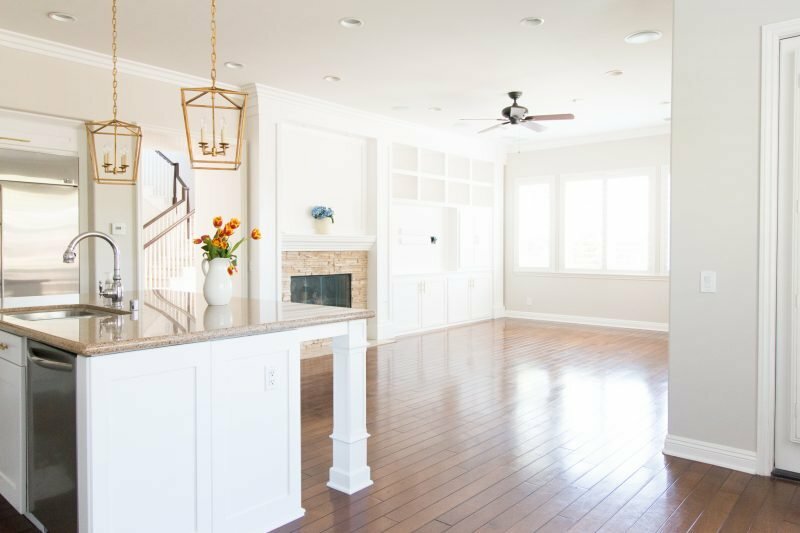 Are the countertops new? No. These are the original countertops. We kept them to keep costs down and live in the house before we make any decisions on changing those. The neutral palette works great for us. Well, my friends! That is a wrap on what we did downstairs prior to moving in. We are very thankful we had a couple of weeks to get this all done. I am not sure we ever would have been able to have it done had we moved in immediately. Now to get unpacking and decorating! I have some fun additions I can’t wait to share with you. Thanks for popping in to see how this process is unfolding. Simply Beautiful! Congratulations on your new home!! Thank you so much! It’s been really fun working on it thus far. Just need a nap soon. LOL. It looks like a completely different house, very light and bright! I’m hoping to do something similar with my own house during our reno next year. The previous owners were very into brown as a color scheme for the walls and since the house doesn’t get a lot of direct sunlight, and it’s in Seattle! it needs some serious lightening up. (they even painted the 3/4 bath dark brown including the ceiling, it’s like a dungeon in there). I’m curious about the cabinets in the kitchen. We are planning to have ours painted from honey maple to likely white (or soft grey, I can’t decide). I know costs vary (and I have a lot of cabinets in my kitchen likely double what you have) but was it very expensive to have them painted? We are trying to come up with a budget before we hire a design/construction company, and I’m really lost on this part. I’m guessing about $5,000 from what I’ve seen on the internet but I’m really not sure. I love the backsplash. It’s simple and clean, but adds more interest than subway tile. I saw tile the other day that has the look of raindrops (scalloped looking), and I really like it, but it’s hard to commit and do it, because what if I end up hating it?! These things keep me up at night! Oh, sounds like you have a fun project ahead of you! You’ll love the lighter and brighter. Especially if there isn’t a ton of light. And a soft gray would be gorgeous, too. I was surprised at how much of a process it was to paint these. But ours were a very dark stain. I completely understand your trepidation with a more creative backsplash. It’s a leap of faith but I am soooooo happy I did something a little bit different. I freaked out at first but now it’s one of my favorite things in the kitchen. Good luck as you take on the painting. Here to answer any questions. Can always shoot me an email. My first thought was: this is so you! I know that sounds strange since I don’t really know you but your style is all over this house already. Just the wall colour, the wooden floors, the White kitchen, the touches of gold. Simple, classic, beautiful. I LOVE that island! And we have a similar colour of brownish-grey granite in our kitchen and it’s great to see that white cabinets work well with it. We’re still saving up to paint over the previous owners’ choice of cream. Looking forward to seeing updates once you’ve added in furniture. You’ve done a lovely job so far. I absolutely love it! And I love the gold but I always get nervous since I remember the desire to change out all the gold door knobs from the late 80s/early 90s. I love that the style is a more modern and brushed gold, but I always get nervous… And now I feel silly and old even saying that! You are also making me want to stain my railings! I was nervous it wouldn’t look right against my lighter floors but it looks amazing in your house! Something to definitely consider! What a beautiful home to come home too and great home for your kids to grow up in. And not even have to change schools. So happy for you all! Thank you very much! It is still sinking in and we are so thankful to have found it. Hope you’re having a good week. Love your new home, so pretty. Can’t wait to see more. Thank you, Marty. We have our hands full but feeling very thankful. Enjoy the day. Love it Courtney! Simple, classic and beautiful. Looks so crisp and fresh!! Can’t wait to see you bring your style in! What a change! It looks beautiful. You were so smart to do all the changes before you moved into your new home. It would have been a nightmare to tackle it with all of your stuff already in place. Beautiful! I’m crushing hard on those gold pulls…so pretty! Everything looks beautiful! I bet you are so excited to move everything in! We just moved to our hopefully forever home in Mission Viejo and are having the kitchen re-done this year as well and I’ve pinned your gold hardware about 50 times! Thanks for sharing! Looks beautiful Courtney! 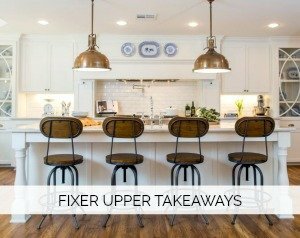 The backsplash is fun and love the pendants lights. You have great taste in home design and fashion! So pretty! 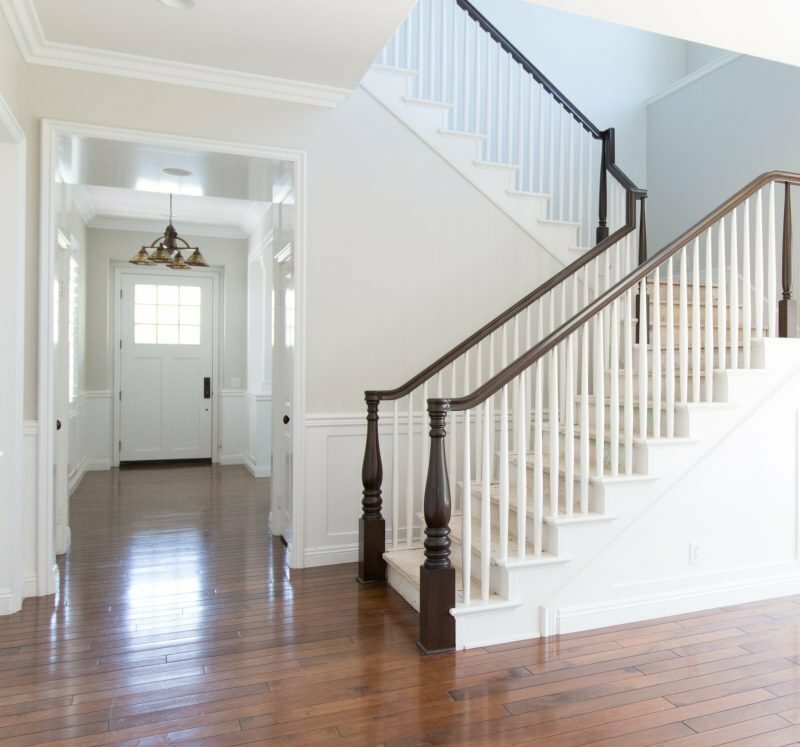 Do you know what brand stain and color they used on your banister? LOVE IT! Beautiful! Love the colors you chose. So beautiful!! What color did you use on the stair railing? We are having ours painted Monday and wanted to see what color you used. Everything looks so fresh and beautiful! I can’t wait to see what you do next. 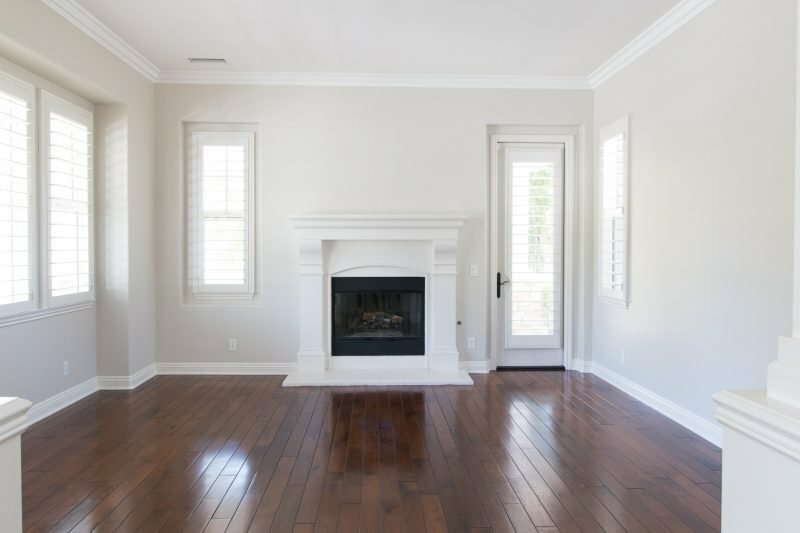 Could you tell me what type of paint finish you used on your walls and trim? Thanks! 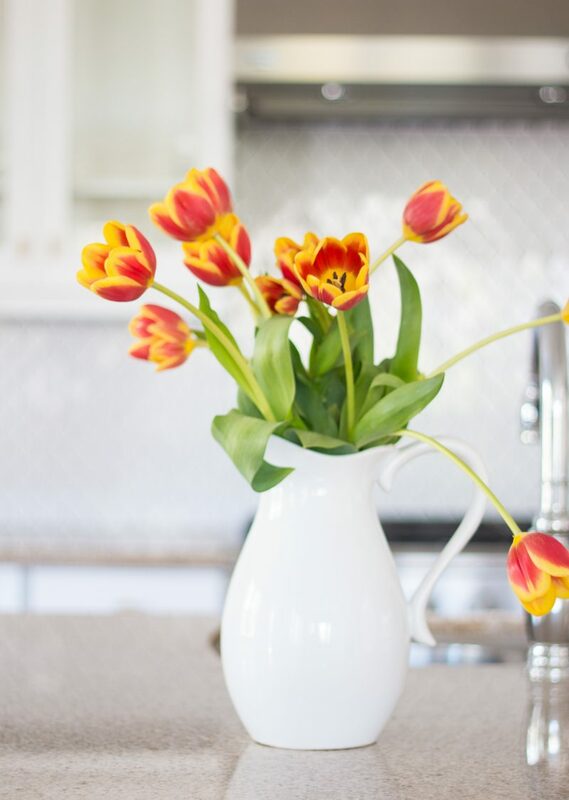 Your kitchen is seriously swoon worthy. Love everything you’ve chosen, but then again, of course I would!! The gold is stunning and so unique. Can’t wait to see more sweet friend. Love your new home! What stain did you use on your handrail? And did it require any sanding? Your house is stunning, so lucky!! I would love to see some closes up and before and after on the cabinets. I want to do mine but concerned it will look painted or not smooth. How does it look when they are open (from the inside)? Would you be able give a rough idea of how much this cost you? I really want a white kitchen again!! Stunning! I love the paint colors you chose. I know photos can be deceiving, is the Pale Oak a cool or warm tone? Thanks! Oh friend – it looks AMAZING!!! I am so happy for you guys and love seeing the progress shots. Amazing, Courtney!! I love your idea to paint the cabinetry white. It does so much for the space. Welcome home!! You must be so excited with how everything turned out. I am definitely going this week to try rejuvenation on our wood floors. I am excited to see more shine in them again! Enjoy this new home with your family!! I love it!!!!! I am totally in love with all of the gold!!!! Looks Amazing! Beautiful!! We have been thinking of having our cabinets painted, can you share more information on this? Any tips? Is it a messy process for those who would still be living at home (we have a 4 month old)? Ballpark cost? It’s looking SOOO pretty Courtney!!! Love love it! Just gorgeous Courtney!!! 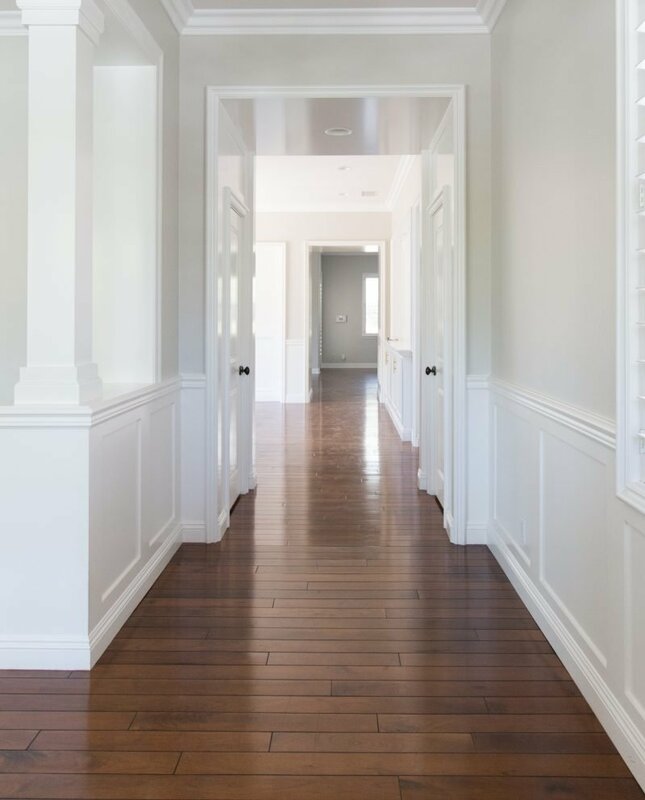 I love Pale Oak in these spaces, it totally refreshes and lightens up the rooms and looks great with the white trim! You are going to have so much fun decorating this house! Beautiful. Can you put the photos before and after side by side? so we can see the different. You are very talented and you inspire us to have a beautiful and organized house. Wow, so so gorgeous!! I love the gold and staining your railing darker actually looks really good! 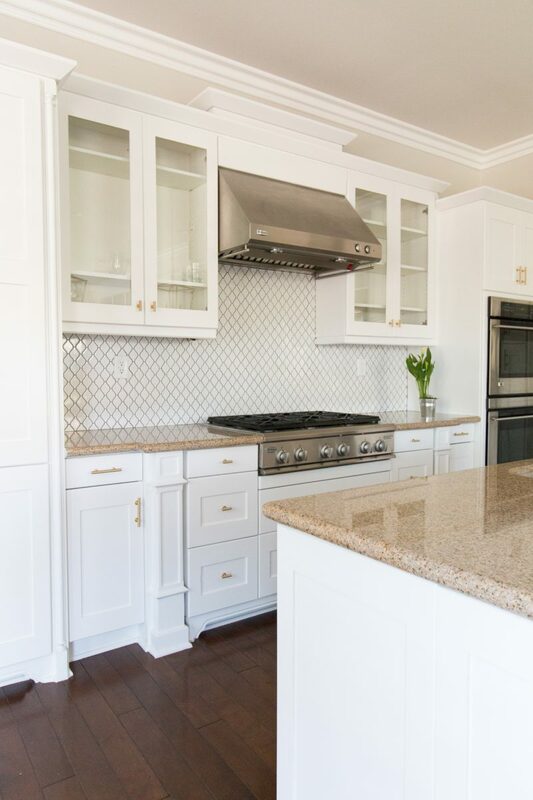 What is the white lacquer color that you used on your beautiful cabinets? We are getting ready to make similar changes at the end of this month. I’m sooooo nervous! Your home is stunning. Can’t wait to see where you go with it! Your kitchen is beautiful! I am using the source link and noticed there are numerous sizes. It appears from your pictures that you used several different sizes. Would you mind sharing which sizes you used? Such a pretty transformation. I saw that you got the kitchen hardware from ATG Stores. Do you know the name/model/manufacturer of those pulls? Did you ever find out the color that the cabinets are painted? Hi there! they are a white lacquer with no tint. Your painter should know what that means 😉 Hope that helps! Hello! I am re-painting our walls and keep coming back to your color colors! I love the light and airy feeling they give and how all the natural light works. I found Pale Oak at Ace, but can’t find White Shadow. Do you mind sharing the brand/source of the White Shadow? Thanks! Thank you so much. I want to say vista . . . but I will need to double check. It’s what was previously used and our painters found it for us. Hi Courtney – thank you! I’ll check out Vista. We’ve had Swiss Coffee for so long and I recently switched to Simply White (a la McGee Studios), but your color combo here would work well in my space. Happy weekend! Everything turned out beautiful! It’s really amazing to see the change just with paint. I’ve been following and love what you have done with the furniture and decor. You’re home is lovely. I just have a quick question regarding the paint. The trim color that you listed: Trim Color: White Shadow is that a Benjamin Moore color or another brand? It looks like just the color I need for my trims. I am looking for something white but not a bright white and this one seems to have a somewhat creamy color to it?